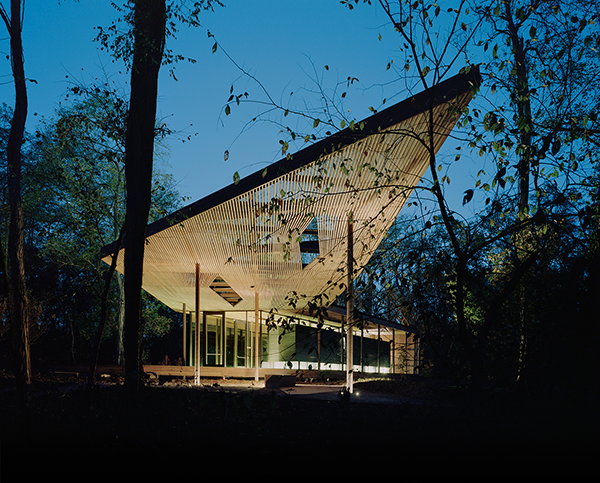 The Visitors Pavilion provides a place of reflection and assessment, a place of questioning what has been directly experienced by the visitor and of what was observed, or not, of the processes – natural and cultural - at work within the Art + Nature Park. It too may serve as a threshold for those entering the park from the Indianapolis greenway system. Educational activities for a few or maybe fifty persons help visitors gain a deeper, and perhaps, even more meaningful understanding of the relationships between nature-made and man-made forms. A refuge from inclement weather, it is also a respite, a place to rejuvenate the mind and body. Activities of identification and examination take place here. Site exhibitions of various sorts are imagined as a means of documenting the traces of change in the Art and Landscape that emerge over time. 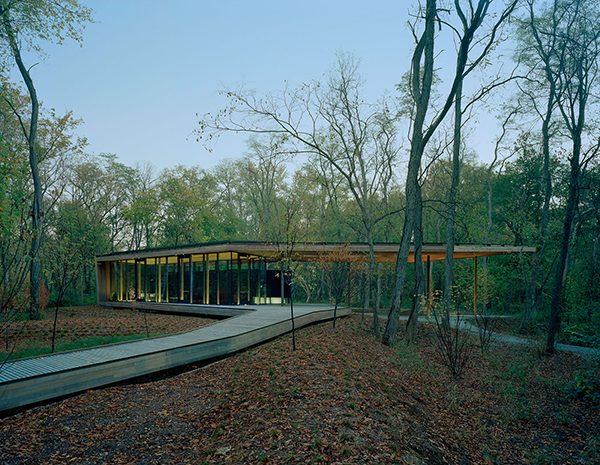 The visitors pavilion is both social and educational. 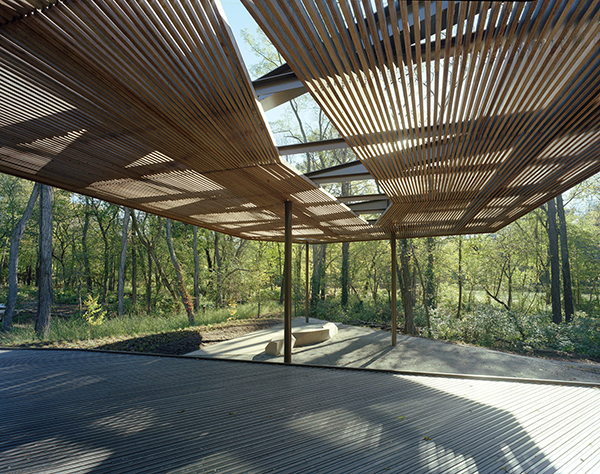 The Visitors Pavilion is light upon the earth, detached with column supports, an overt horizontal frame structure in tension as much as compression. 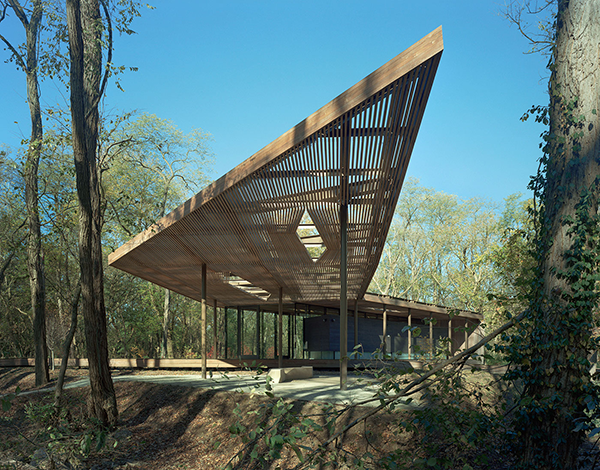 A continuous perforated surface of wood slats forms a semi-transparent envelope supported by a steel exoskeleton. 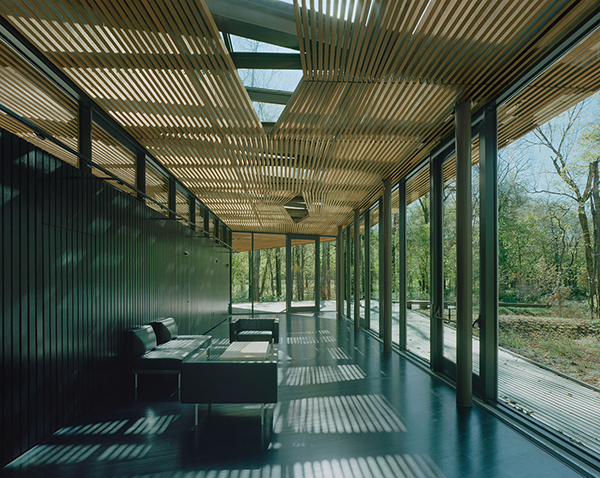 Walls, roof, and floor decking allow natural light and moisture to filter through it. The folded planes of the envelope sandwich glass enclosed program elements. 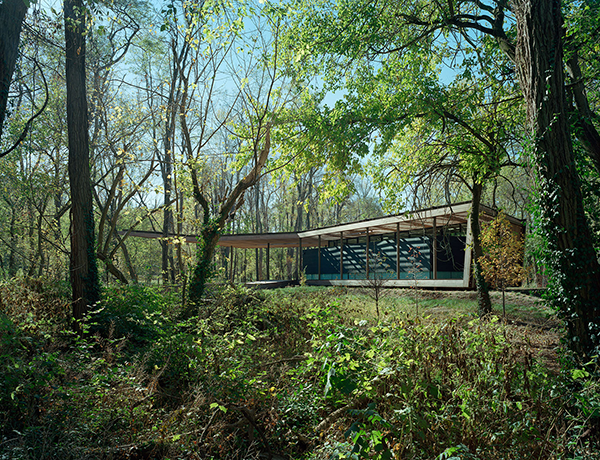 Here, covered exterior space and interior space, nearly equivalent, become interchangeable and multi-functional. 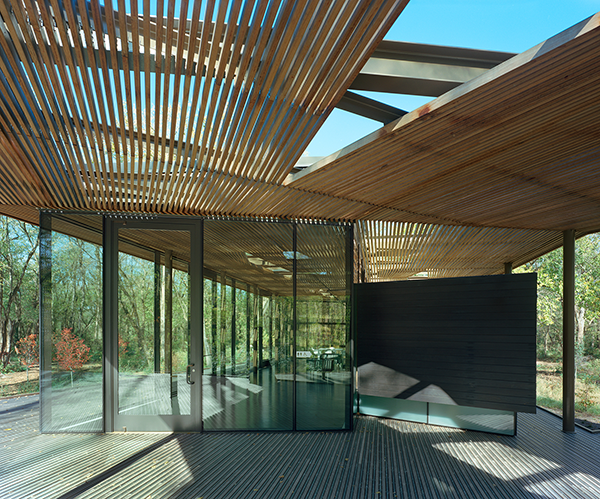 Reflections of the trees in the glass cladding act as a camouflage for the building in its setting: a low-slung form, bathed in dappled light, apparently floating among the trees, an apparition in the garden.